Andon is the Japanese term for a signalling system within a production process or plant. The Japanese use Andon systems as a communication tool to communicate the status of a production line or process to all production employees on the production floor. Andon systems are usually found in many forms, from simple status lights or traffic light systems to complete display boards in visible locations around the production plant. They are a common tool in the automotive and component production industry where they are an integral part of the Toyota Manufacturing system. Andon display boards usually display a more comprehensive set of signals, KPI's or data about the production process. They can vary in size and KPI's displayed, some are illuminated, have led displays, or are flat screens presenting production or process data in live real time. These Andon signals help the process workers communicate with production supervisors and factory managers. They also aid in quality control by having the ability to stop production and tackle quality issues as soon as they are identified and signalling other workstation operators and supervisors of the stoppage. - Different production KPI's or goals such as planned production. The Japanese auto manufacturers and other organizations which have implemented Andon systems throughout their production processes have found them to be very useful and a contributing factor to their company cultures, efficiencies and lean manufacturing initiatives. An example of an Andon Signal display board which would be found in a production process is depicted below. Notice the use of colours in the status lights and setting readings. Colour coding is an important characteristic of Andon signals as different colours may have different meanings and prompt actions by process operators and supervisors. 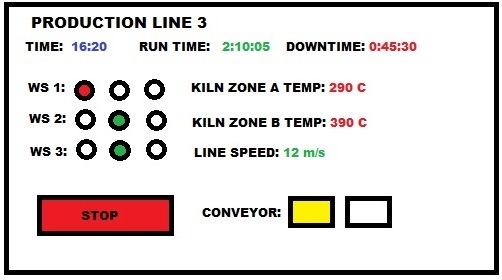 Fig 1: Andon System display board in a production process example. This board would be displayed on the production line or in an easy to view place for all process operators and supervisors.